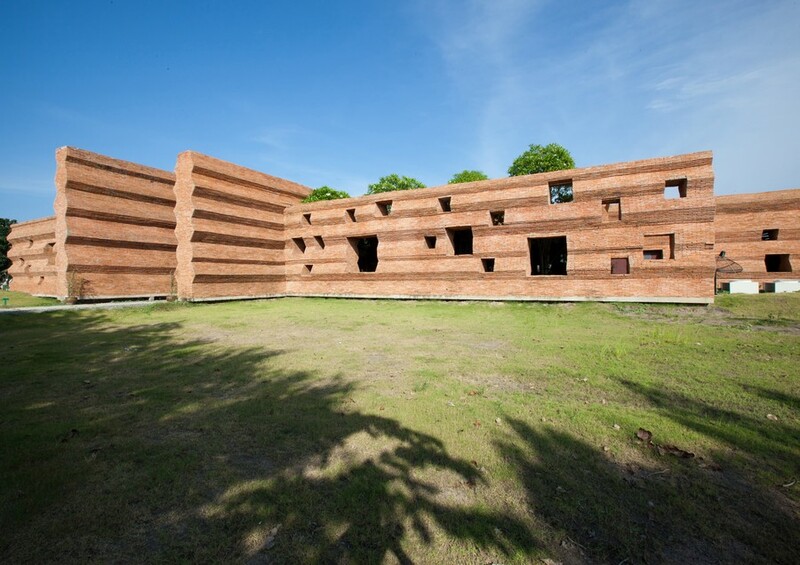 Massive eight-metre-high handmade brick walls with undulating geometric profiles characterise this undergraduate college. They are supported by a steel inner structure, the cavity between inner and outer skin affording protection against heat transfer. The complex’s five different areas – administration office, lecture room, workshop, library and canteen – are all connected by an ‘inserted forest’ in the form of a greystone and concrete pathway punctuated by trees, running centrally along a solid east-west and a broken north-south axis. Where this extends beyond the confines of the functional buildings, openings in the walls provide relaxation spaces and a link with the green landscaping beyond.